Today was a sad day but more on that later. Wonderful weather has continued and will continue right through till Wednesday which will again make for some difficult angling in bright sunny conditions. I think we can all agree that NZ needs some rain and it would be nice to see a couple of rain filled days and a cold snap before we flow into summer and the world cup. We have had a very warm and dry winter and we already areÂ having some days in which I should have had some sunscreen handy so it looks like winter may have skipped us this year. The lake is slowly but surely dropping which is allowing anglers to get closer to favourite river mouths to access the drop off’s in which trout will hold. This is fantastic for the lake fisherman but not so good for our river fisherman as it simply means the rivers are not running hard enough to keep the lake full. All rivers seem to be low and clear and have now developed summer slime which will keep anglers on their toes when attempting crossings. The summer slime is great for creating homes for insect life and we should start to see these critters turning up in trout stomachs in big numbers in the following weeks. The Hine and the TT seem to be the hardest hit with the recent lack of water which has left very little holding water leaving trout to be forced to be stacked up in the deeper pools if they even decided to run the river at all. I fished the Hine quickly on Saturday but gave it away when none of my usual lies were notÂ working as Â I could’nt achieve a good drift in the shallow conditions. I think this will be the same story on the TT and it may be time to cover these waters with the Dry and dropper rig as this will cover those shallower riffles effectively. More rain and a cold snap will change all this and push more runs into the rivers to fill the gaps. Tongariro was on the cards with Matt from TaupoÂ Rod’n Tackle this morning so we decided to hit the braids at first light along with about ten other anglers. Angling conditions were great for the first hour before light and it was so nice to be in the fresh air watching my indicator bobbing along and listening to the birds wakening. Watching my indicator was about the only thing I did for two hours as not once did anything fishy drag it under-to make things worse bloody Matt walked back from a spot that I had sent him toÂ with two fish hanging from his belt. Listening to his gloating of success was enough for me so I went and received another earÂ bashing from Shaz while trying to enjoy aÂ coffee, why do I do it! 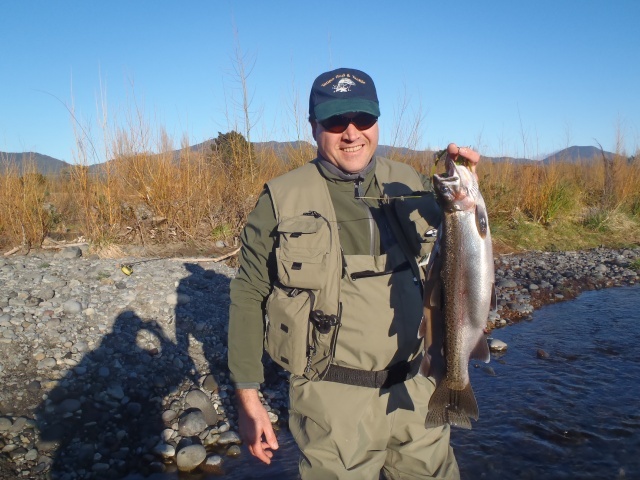 Anyway the day was amazing so we carried on fishing the Tongariro whichÂ was still prooving to be tough for most in the clear conditions so we soon switched back to the Waitahanui which is lucky enough to have some solid flow at the moment. This riverÂ is pretty much spring fed and should hold it’s levels and clarity quite well while other rivers can be drastically changed with rain or lack of. As you will know I am not really a big fan of this river but lately I must admit it has been very good and a pleasure to fish. It certainly isÂ a beautiful river which boasts some of the best pieces of water in the Taupo fishery but with spawning runs in recent years small and hard to find on this river it has had a bad rap. WeÂ decided to fish the upper section from the Pig Pool to the Gordon Williams which can easily be accessed by parking in the turning circleÂ up Blake Rd. It was not long and we were spotting fish in most pools which seemed relatively relaxed for a Sunday afternoon so they must not have seen too many anglers for Fathers Day. A quick switch of rigs and a little more weight soon saw a bend in my rod while briefly attached to a silver jack which escaped down the rapid of the Pig Pool-always happens. Matt hooked up on his first cast at a fish witch was holding on a sand bar but this poor old fish had done it hard for several months and looked like I did when I got back from Las Vegas last month so heÂ quickly gave up and was released. One of my favourite poolsÂ again produced on the second or third castÂ but once again I only managed to stay hooked up for a few seconds. We all get days when things don’t go our wayÂ but eventually things change with time except for this day which saw me loose the next 5 fish from this tiny piece of water. I am quite a stubborn guyÂ so I have been told so I kept flogging away with different rigs, weights glo bugs in hope that their was just one fish left in the pool in which I could land.Â After about 400 drifts through the same piece of water my indicator finally reacted differently and I was hooked up to something quite solid which gave a fishy throb every now and again. I have caught many big browns over the years and this reacted excatly the same way with slow deep earthy pulls and hard head shakes while staying deep in the pool. After a couple of minutes I could see my fish with the bright orange glo bug secured in his bottom lip as he steamed back and forth working out his best escape route, it was then I realized I had a #*!#% big fish on and it was a much sought after Rainbow Jack. An eventful day for me with quite a few fish hooked and sighted upÂ the Waitahanui so if you are heading over to do some fishing maybe itÂ is worth stopping in and having a look in here.